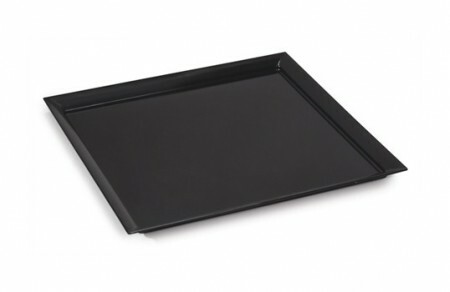 GET Enterprises ML-244-BK Siciliano Black Square Display Platter 24"
TigerChef > Dinnerware > Melamine Dinnerware > Melamine Serveware > Melamine Serving Sets >< GET Enterprises Siciliano Dinnerware > GET Enterprises ML-244-BK Siciliano Black Square Display Platter 24"
$65.99 GET Enterprises ML-244-W Siciliano White Square Display Plate 24"
$72.99 GET Enterprises ML-241-BK Siciliano Black Round Bowl 26.6 Qt. $55.99 GET Enterprises ML-242-BK Siciliano Black Rectangular Tray 28" x 16"
$72.99 GET Enterprises ML-241-W Siciliano White Round Bowl 26.6 Qt. $55.99 GET Enterprises ML-242-W Siciliano White Rectangular Tray 28" x 16"
Impress guests by serving entrees, appetizers, and specialty dishes in the GET Enterprises ML-244-BK Siciliano Black Square Display Platter 24" Boasting a sleek black finish and smooth surface, this platter adds a simple yet contemporary look to any table setting. Made from BPA-free melamine, this dish is break resistant and exceptionally durable. Perfect for use in restaurants, hotels, or catered events, this display platter is commercial dishwasher safe for easy cleanup.